Integrated DNA Technologies (IDT) has introduced its rhAmpSeq targeted sequencing system, providing researchers with highly accurate, cost-effective and easy-to-use amplicon sequencing on Illumina next-generation sequencing (NGS) platforms. 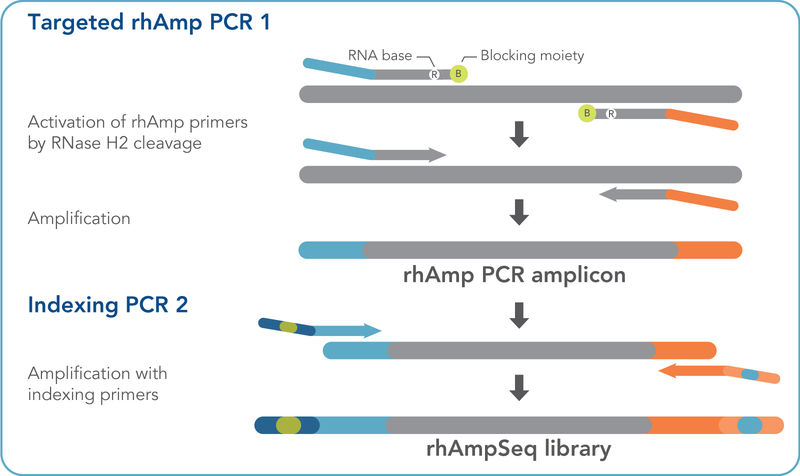 The rhAmpSeq chemistry enables multiplexing at impressive levels with high on-target rates and uniform coverage, delivering accurate results and accelerating projects. The system has wide-ranging applications, including human disease research and sample tracking and analysis, CRISPR genome editing analysis and agricultural biotechnology. In recent years, the cost of NGS sequencing has dramatically decreased; however, costs for sample library preparation have remained relatively static. To advocate for genomics researchers by lowering the cost barriers and making workflows simpler, IDT has developed the rhAmpSeq system to combine the power of NGS with the simplicity and value of PCR. The new suite of targeted sequencing reagents is the second largest genomics product using the firm's RNase H2 PCR (rhAmpPCR) technology, following its popular rhAmp SNP genotyping system. The technology employs an RNase H2/DNA polymerase two-enzyme system coupled with RNA-DNA hybrid primers that increase the specificity of PCR amplification while minimising primer dimer formation. The system enables high multiplexing levels, minimising the number of reagents needed and lowering costs thanks to its ability to minimise primer-dimer formation and misprimed PCR products. A streamlined, easy workflow saves time, generating NGS-ready amplicon libraries in just two simple PCR steps. Professor Bruce Reisch at Cornell University's College of Agriculture and Life Sciences leads a multi-institution research collaboration that has been adapting rhAmpSeq technology to their 250-bp haplotype strategy targeting the core genome. He commented, "As early testers of the rhAmpSeq system from IDT, we were really pleased to see how we were able to rapidly accelerate the VitisGen2 program by using a nearly 2,000 marker rhAmpSeq panel to analyse 19 Vitis linkage groups. The core marker set was useful across six unrelated populations representing the diversity of the genus, and the workflow was very easy to use and allowed high-throughput processing." IDT has optimised the rhAmpSeq system for consistent performance across panel sizes from tens to thousands of amplicons in a single multiplex reaction, and the system can be used with either a regular or high-throughput protocol to match individual needs. In addition, the system is highly versatile ­ the technology enables researchers to design large custom panels with flexible amplicon sizes that can be tailored for various applications and sample types.